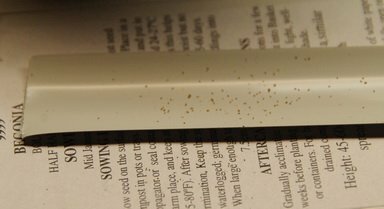 Dallying In The Dirt, Issue #155 --- The tiny begonia seed is being planted now. We have beaten off the great ice storm and shoveled more than our share of snow. The pile of snow and ice chunks at the end of the driveway may melt by June. We did a little skiing, celebrated Christmas and New Years with family and friends and enjoyed the various Orchids blooming in the solarium. It’s now time to get some soil under the fingernails and start to satisfy this gardeners need to play with green growing things. The sample Begonia boliviensis seedlings are growing nicely and it’s time to start the main crop. I was, way too early, last year so we are just over a month later this year. It’s still going to be exciting to see if these seeds have the same flower size and colour as their parents and we won’t know that for a while. We do have a few plants growing from cuttings and a bin filled with the huge tubers that they made last year. The seed is as fine as dust and is very difficult to sow thinly and evenly. This problem was compounded by the video team from Metroland’s “This Week” who wanted me to do it over a couple of times to get their shots right. I’m sure there are well over a thousand seeds sprinkled over the surface of that very fine soil. May the strongest survive. The downside of having the videographer in my basement was the urgent need to actually clean up the basement, a rather nasty chore that has been ignored far too long. The Assistant Gardener somehow saw this as a bonus! The Geraniums that have been thriving under the lights since October are now outgrowing their space. 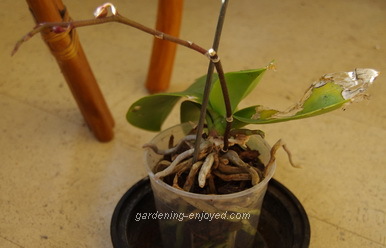 We took the pruners to them and reduced them down to a few leaves and some tiny new growing points. They should now grow into compact bushy plants. An intelligent gardener with a space problem would just throw all those pieces in the compost. We of course made several new cuttings from them and stuck them into the propagating bed. It’s already warm and moist to start the seeds so we are just making good use of all of that facility. 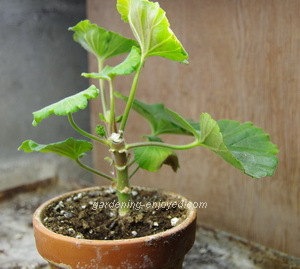 I’ll figure out what to do with the new Geraniums when it’s time to transplant the rooted cuttings. Of course, a few of the Begonias received the same treatment. Having cleaned out the basement, maybe there is room for more lights. The Assistant Gardener may have a divergent opinion. We gardeners get very worried about perfection. Mother Nature doesn’t really give a toss. She understands, what we don’t want to accept, that all of her creatures have their place and they do interact with each other. I have a collection of Orchids that spend the summer outside where nature’s creatures are free to interact. The Phalaenopsis in the picture has certainly interacted with several things during the summer. The perfectionist gardener may have decided not to give it house room in the fall. What a mistake. Despite the torn and chewed leaves one of the old bloom stalks is throwing new buds and a brand new bloom stalk is emerging from the base. Those flowers just need the support of some leaves doing their photosynthesis thing as best they can and the new flowers don’t know or care whether their supporting leaves are perfect or not. May be a lesson here for the human race as well. There was a dearth of questions over the holidays, gardeners were too busy celebrating and relaxing. Here’s a made up one to allow me to rant a bit about one of my pet peeves. Don’t forget to check the front page of the Website for frequent short ideas for current gardening activities. Claire Asks? What do I do with my Poinsettia now? Ken Answers! Toss the wretched thing in the compost. All of the leaves have fallen off leaving only bare stems and the coloured bracts. The Roses you paid $30 for are long gone why do we feel a need to keep a $6 Poinsettia just because it has a few roots. It’s possible but highly unlikely that you will be able to return it to its former glory next Christmas.